You never know what a client may want from voice over auditions. This job came from an audition on a P2P site. 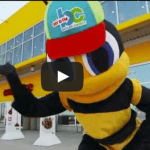 It was listed as a VO for a “Bee” character, that was going to be in a recurring campaign for the Visitor’s Bureau in Butler County, Ohio. Now everyone immediately assumes that a bee character would need a little buzz in the voice. Maybe, there would even bee wordzzzzz that could be drawn out, to indicate the particular character voice of a bee. Or maybe, if you’re Jerry Seinfeld, you would just use your own, very recognizable voice to become your bee character (check out Bee Movie if you haven’t seen that one yet, funny stuff) . But when dealing with voice over auditions on a site with lots of competition and only a few words of written direction, it’s sometimes very hard to know what the clients are really looking for. Now, of course, the idea in going into voice over auditions is to apply the best “Me” to the copy, since I am the unique feature in the equation. Oftentimes, if one just attempts to give the client what they “think” they want, (clients sometimes don’t know it until they hear it) it becomes a cheap imitation at best, and may be doing a disservice to one’s own talent as a voice actor. For this particular audition, since it was a short commercial type piece of copy, my strategy was to give 2 versions of the spot, allowing for some variation in vocal delivery, and then putting what I thought to be the strongest version at the beginning of the file submitted. So, I did a version that had a cartoon style voice, with animation and energy, and NO real buzz, and another version where I exaggerated the “zzzzz’s” that I could find in the spot. What I found out after winning the job, was that everyone was sending in the stereotypical exaggeration of the buzzing of words, and that they liked my read that DIDN’T have that extra sound. So, the moral of my story…..? BEE careful to NOT try to second-guess the client. Give ’em your best shot of YOU and hope that it comes across as sweet as honey! Debbie Grattan is a Female Commercial Voiceover Talent who has been recording professional voice-overs for more than 20 years. To date she has worked on over 10,000 projects and has partnered with hundreds of production companies, marketing and advertising firms, commercial voice-over recording studios and corporate/business clients around the United States and abroad. Check out her Commercial Voiceover Video Demos and request a custom voice over audition for an upcoming project. Some great advice in here! I’ve made the mistake of second-guessing what a client wants in the past, so is good to be reminded of this lesson.